This hand-painted coat was designed by Richard Cawley when he was an assistant designer at the London fashion house Bellville Sassoon. It was presented as part of the 1970 Winter Couture collection, which was inspired by Indian art and culture. This coat was named "Rajputana" after a former group of princely states in north-western India and featured in colour in the November 1970 issue of Vogue magazine. After being made up, the plain cream wool coat was hand-painted with vibrant floral motifs inspired by Indian art in the Victoria & Albert Museum's collections. Cawley co-designed the motifs with Andrew Whittle, a student at the RCA Illustration School, and the actual painting was done by Whittle. This coat was worn by Sara Donaldson-Hudson for her registry-office wedding to Nicholas Haydon on 23 April 1971. Sara’s mother, Dorothy, was a dedicated follower of fashion who did not want her daughter to wear white to marry a divorcé. Between them, they chose this colourful coat, which was worn with a bright orange shift dress and orange satin knee boots which matched the coat lining. 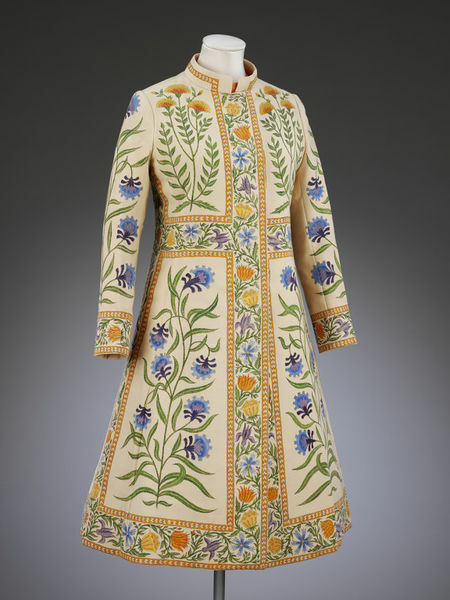 Knee-length cream coat painted with design of blue and orange flowers with an orange border. Made of handpainted wool crepe lined with silk, fastened with plastic buttons, machine stitched and hand finished. Lined with orange silk. It has long sleeves and a small upstanding collar and is fastened in front with 5 buttons painted to match the decoration on the coat. This coat was worn by Sara Donaldson-Hudson for her marriage to Nicholas Haydon on 23 April 1971 at Caxton Hall Registry Office, Westminster, London. Sara wore it with an orange satin shift dress and matching orange satin knee boots made by the Chelsea Cobbler. The coat was designed by Richard Cawley (b. 1947) who graduated from the Fashion School of the Royal College of Art in summer 1970. He was recruited by David Sassoon to work as an assistant designer for Bellville Sassoon (founded by Belinda Bellville in 1953 as Bellville et Cie), so this coat would have been one of his first designs after graduation. The painted designs were co-designed with and executed by a fellow RCA student, Andrew Whittle, who graduated from the Illustration School in summer 1971. Coat, designed by Bellville Sassoon, London, for their autumn/winter 1970-71 collection. There is no dress code for civil weddings but in 1970 Sara Donaldson-Hudson's mother told her not to wear white because her husband-to-be had been divorced. 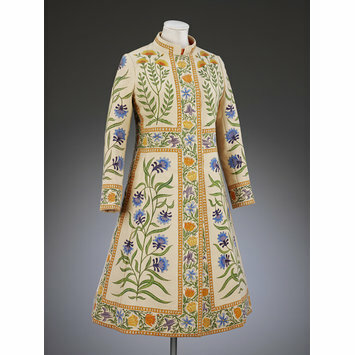 Instead they chose a striking hand-painted coat whose design was inspired by Indian artefacts in the V&A. The bride wore it with an orange satin dress and matching knee boots. Designed by Richard Cawley whilst an assistant designer for Bellville Sassoon. The painted design was worked out by Cawley with Andrew Whittle, and painted by Whittle.